As far as uniforms go, flight attendants may outshine most other service industry standards, but it’s far from high fashion. Chinese airline Hainan Airlines is looking to buck the trend by providing their on-flight staff with stylish couture uniforms. Debuting at Paris Couture Week, the new uniforms were designed haute couture designer Laurence Xu. The female uniform is based on a traditional Chinese dress called a Cheongsam and comes in a pattern with traditional imagery, like clouds, waves, and rocs. There is also a more Western style apron and coat in a light gray that mesh well with the dress. The entire design process took over two years to get to the final product. 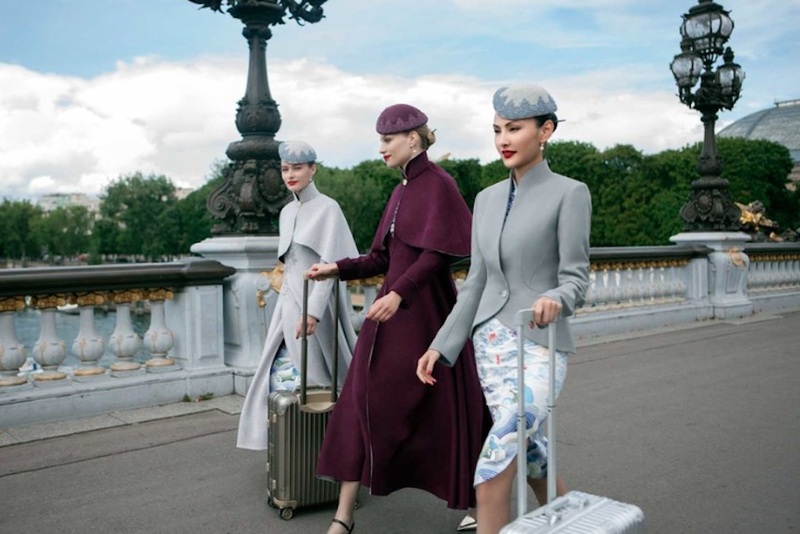 “During the design process, Hainan Airlines and Laurence Xu met and talked frequently, going through more than 1,000 design blueprints and trying out more than one hundred samples of garments and accessories,” according to the airline’s statement on the new uniforms.